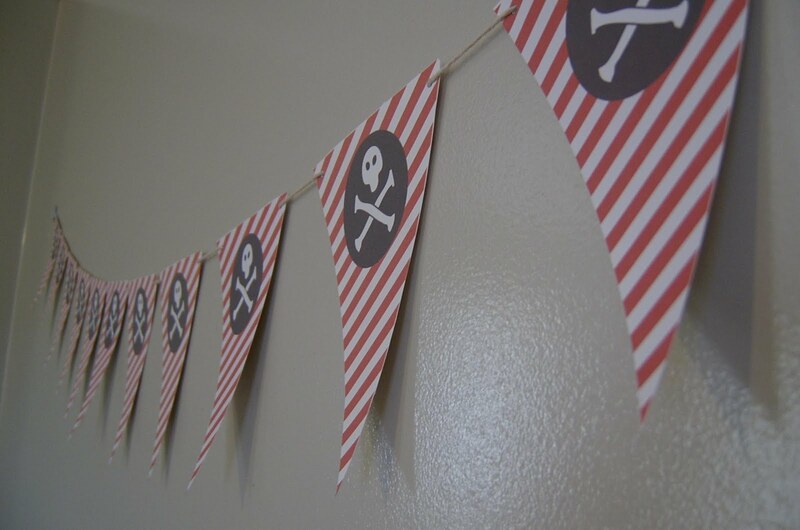 frankly my dear...: Pirate Party Done & Dusted. 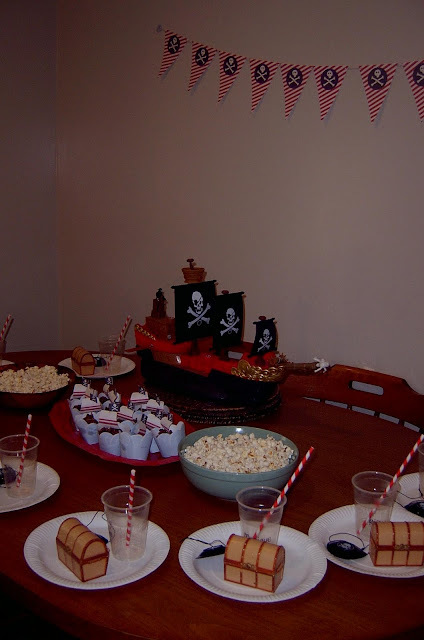 Pirate Party Done & Dusted. We had the party at home - i know.....gasp!!! I realize that having a party at a play centre, pool, gymnastics centre, fast food outlet etc, is a heck of a lot easier, but i personally can not get my head around paying a crazy amount of money for a measly amount of crappy food & a miserable icecream cake - besides.......this mumma enjoys creating a party with a theme. I found the free printable bunting, cupcake wrappers & toppers over here & she also has invitations & a few other goodies in the pirate theme. Aren't they wonderful?! A lovely friend gave us the little treasure chests & a big inflatable treasure chest (which i forgot to take a photo of), we filled the mini treasure chests with some treasures & locked them, at the end of the party we gave each child a key to open them. 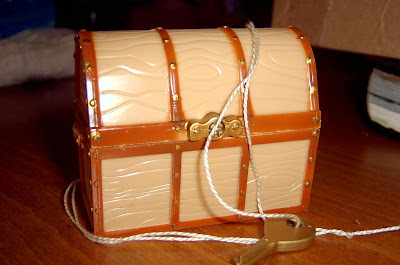 The big treasure chest was used for the guests to place their gifts in. We entertained the kids with a treasure hunt outside & of course buried the prize in the sandpit. It was far too wet & sloshy in the backyard for them to play unfortunately, so we stayed indoors & ate & played more games. And naturally there was cake!! Isn't this cake awesome? 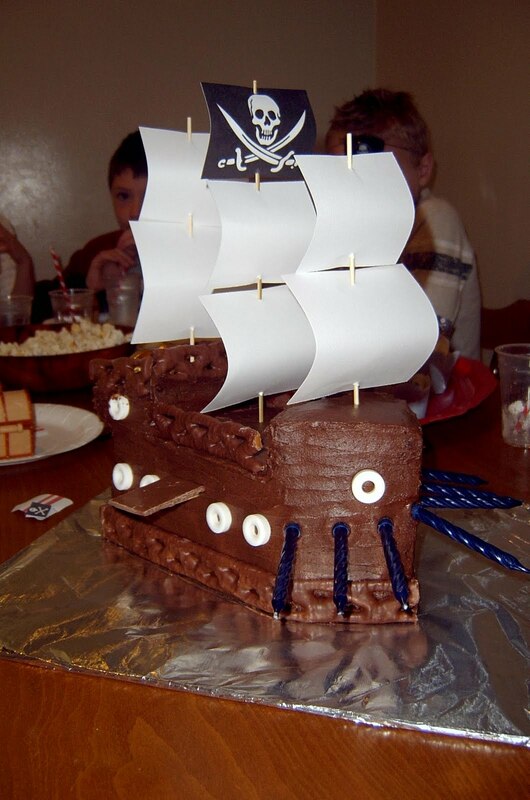 I am lucky enough to have a very talented sister & sister-in-law who can create wonderful kids cakes, my sister-in-law Holly made this pirate ship cake for Chas & she did such a great job, he loved it! So that's it. We had one very tired pirate by the end of the day, but a very happy one too. oh wow what a great looking party, well done. That is one awesome cake!! !